Our experiment in collaborative percussion officially begins on March 19th. 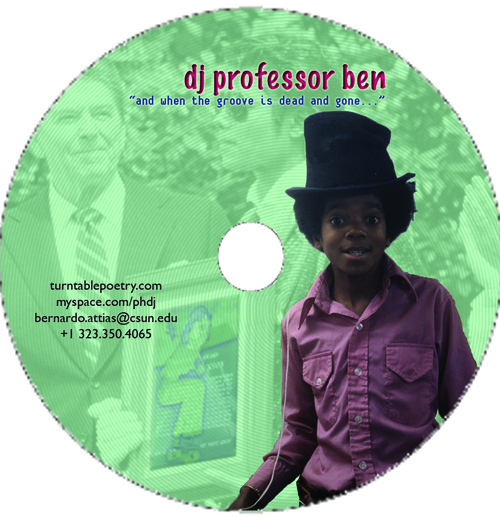 Join DJ Professor Ben, world reknown drummer Bernie Galane, and tapdancer Nicole Embree for a night of improvisation on turntables, drums, and shoes. Thursday, March 19th at the Stone Bar in Los Angeles. Come check it out! I can’t say I’m an expert on country music, and as an electronic music & hip-hop DJ I’m probably not supposed to admit to liking any country music at all. But I do, and I’m particularly a fan of the Man in Black. So when I heard that there was a Johnny Cash remix album coming down the pipe featuring the likes of Alabama 3, Mocean Worker, and Philip Steir, I was naturally intrigued, and I rushed out to check it out. Well, it’s not in stores yet, but you can stream some of the goods from the official site, and I hear that you can download high quality MP3s from the usual places. Official release date is either October 14th or January 27th, depending who you believe, and in addition to all the hype surrounding this release, you can enter a Remix Contest at Acid Planet — the winner’s digital release will accompany the release of the album. (Deadline is in a couple days, unfortunately; I wish I knew about this earlier). I suspect the pre-release version of the album is missing some songs, as I couldn’t find my most anticipated track, “Hey Porter” remixed by Mocean Worker. Based on what is available, however, I’m mostly disappointed though not really surprised about that. Once I heard that Snoop Dogg was a major force behind this compilation, I knew there was going to be trouble. It’s not that the beats are lacking on the ODT Muzik remix of “Walk the Line” that Snoop raps on — quite the contrary. It’s just that when all is said and done, this is basically a Snoop Dogg song — all of the ego of a Johnny Cash original with none of the justification for it. The Johnny Cash vocals come across as flat and empty, clashing badly against the phat beats, and who really wants to hear Snoop echoing bits of Johnny Cash’s chorus? And does anybody believe that the creator of “Ain’t No Fun (if the Homies Can’t Have None)” can even relate to the sentiment of the original? Other tracks on the record don’t fail nearly as badly, and there are some genuine gems on here. Philip Steir’s reinterpretation of “Get Rhythm” is positively inspired — a dance floor hit. You wouldn’t consider this one a country song, but the original vocals fit perfectly into the mix rather than contrasting awkwardly with the electronic dance music like the Snoop song. And the Alabama-3 track is outstanding - as to be expected; these guys are well known for their incredibly interesting work across genres (particularly country and electronica). But this is definitely a whole new song inspired by Cash rather than a “remix” per se. Overall, this collection is definitely worth a listen, but don’t expect consistency or to be blown away by a new musical trajectory. In parts, this comes across as a little too blatantly shameless an attempt to, erm, cash in. When Johnny Cash covered songs like Nine Inch Nails’ “Hurt” or (with Joe Strummer) Bob Marley’s “Redemption Song,” he showed an incredible amount of respect to the originals while at the same time making those songs his own. This isn’t an album of covers per se (though some of the songs on here might be better described as that), but it seems to me that when someone goes through the trouble of remixing and reinterpreting songs of a well known artist, they should do something similar. Most of the time that’s not what’s happening in this case. By the way, speaking of just cashing in, there is apparently a “documentary” in the works about the making of this album. Are you kidding me? Below are some links to mp3s of my mixes. They are large files, each about 40 minutes to an hour and 10 minutes long. Enjoy! Dance While You May - About a year old; this started as a short breaks mix at Scratch Academy for the 151 class and developed into an extended breaks/drum n bass mix with some other goodies thrown in (and one song I never shoulda played, see if you can guess which). Che’s Lounge - Slow and loungy, this dates back to 2003 I think, and still may be one of my best recorded mixes.